There are two strange things about this upcoming launch of Nokia. We are talking about Nokia C5-03, a phone all set to be launched by Nokia by the end of November. First and foremost is that this one runs on Symbian 1 operating system. When Nokia itself ha launched devices based on Symbian 3, this Nokia C6-01 alike being launched with older version Symbian S60 5the edition is quite a disappointing proposition. Other strange thing is the complicated Nokia model numbering scheme that gets this phone a name that this one holds. Whatever, but Nokia C5-03 is all set to hit the Indian market most probably by end of November 2010 and is a Symbian^1 touch phone. The phone is endowed with many more impressive features as the 5MP camera, Wi-Fi and GPS. The other features working in its favour are it's lightweight (it just weighs 93 grams), sleek dimensions (it measures 105.8 x 51.0 x 13.8 mm) and 3.2" nHD (360x640) resistive touchscreen. The 5MP camera (fixed-focus) of new Nokia C5-03 is awesome and clicks photos with real colours and sharp quality. It also comes pre-loaded with a 2GB microSD card in the box. There is Wi-Fi and GPS on-board along with Ovi Maps. The voice-guided navigation features comes free with the handset and makes it quite easy and enjoyable. 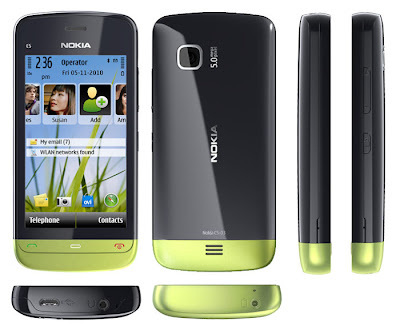 Nokia C5-03 is supported on quad-band GSM/GPRS/EDGE network besides support of a tri-band 3G network that gives good downloading speed 10.2Mbps on HSDPA and 2Mbps on HSUPA. There is a 1000mAh battery laid out in the handset that promises enough battery life of up to 25 days of standby and 11.5 hours of talk time. 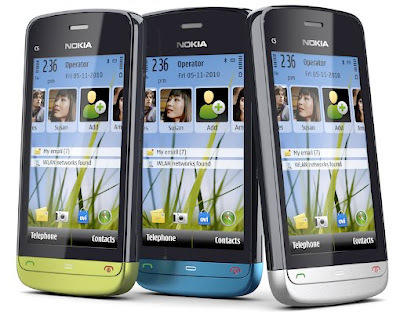 With use of Bluetooth headset, 19.5 hours and otherwise 35 hours of music playback can be supported by the battery of Nokia C5-03. The Nokia C5-03 is quite similar to Nokia C6-01 specifications-wise and hopefully will be as much sought after also.The Nokia C5-03 can be fetched at a price of Rs. 12,000 in India.